It’s Time to Act! and the Abortion Rights Campaign and pro-choice groups across the country want to help you get moving to the annual March for Choice. If you are going to the March for Choice and looking to join pro-choice groups from your area, look no further than our handy guide to transportation to join your siblings in Dublin on 30th September 2017. This page will be updated as more buses are organised; however if a bus from your area is not listed here, feel free to contact your local groups as they may be organising carpooling. You can also find the latest updates on our Transportation Facebook page. Join Alliance for Choice in our trip down to Dublin for the Annual March for Choice. Bring Placards and sturdy shoes! We will meet at 10am by St Anne’s Cathedral. Bus leaves Dublin at 6pm – pick-up point to be confirmed on day. Standard return €15, Reduced price €10, Fully subsided places available. Tickets must be paid for in advance! To book please email [email protected] with your Name, Email, Phone number, Names & Numbers of passengers you are booking in. You will then be sent a PayPal link for payment which must be paid in full in order to secure a place. We are organising buses to and from the march, at a cost of only €10. ARC will also be providing a Breakfast for Choice when we arrive. To book your place on the bus, email us at [email protected] using the subject line “Bus4Choice”. Leave us a name and contact number. Spaces will be allocated on a first come, first served basis. We would ask that if you are unable to follow through on your booking that you please contact us ASAP so we can allocate your seat to someone else. There will also be a bus from West Cork organised by West Cork Pro Choice Group and West Cork People Before Profit Alliance. We will update this event page with pick up times when we get a solid idea of numbers but we imagine it will be between 7-8am. We will have to leave Dublin at approximately 6/7pm. We will be asking for a €20/£18 donation or as much as you can afford, we will not turn people away for lack of funds! We will be leaving Tralee at 7.30 am (pick up point to be announced), stopping off in Newcastle West at 8.30 am (pick up point to be announced), return time 6pm (pick up point in Dublin to be announced). Places on the bus are limited, so book early to avoid disappointment. You can do this by messaging our page. The Clare bus will also stop in Limerick. Pick up at Arthurs Quay, Limerick on Saturday at 8:45am sharp. Seats must be paid for in advance. To book a place, please message our page or email [email protected]com with your: Name, Email, Phone number, Departure town | Prices: €15 return – waged, €10 return – underemployed/student. You will then be sent a PayPal link for payment which must be paid in full in order to secure a place. The bus is welcome to all. Prices to be confirmed. Join Meath for Choice on this year’s March for Choice. We have organised a bus to the march with 3 pick-up points across Co. Meath to arrive in Dublin for 1.30pm. PM or email [email protected] for full itineraryitinenary, cost and to book your seat! Bus leaves at 8 am from Markevitz Rd ( Across from Connollys bar Sligo ) Return time 6pm (pick up point for return to be announced at a later date ). Prices €16 return waged | €10 student and unemployed. Talk to us in confidence if you need a full subsidy – please dont let money stop you from missing what is a powerfully inspiring day #Repeal the 8th – Places limited so book early to avoid disappointment. 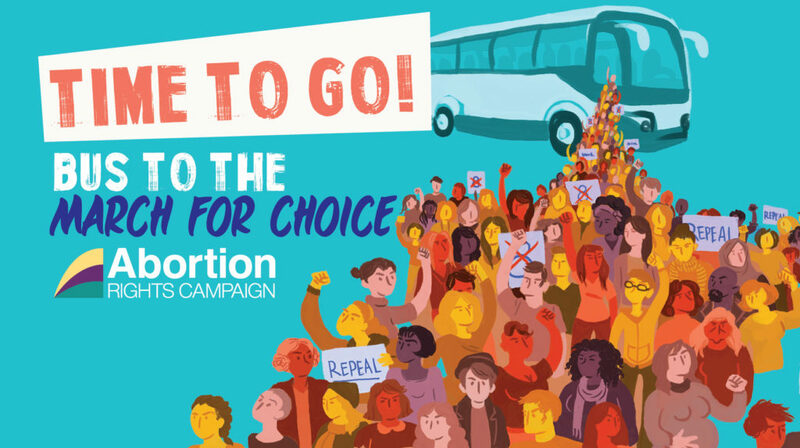 Tipp for Choice is delighted to partner up with Abortion Rights Campaign Clare to provide a bus from Nenagh. The bus will leave from Ennis on Saturday at 8am and will make stops in Limerick and Nenagh. Pick-up in Nenagh at Banba Square is at 9.30am. Return time 6pm (pick up point in Dublin to be announced). To book a place, please message our page or email [email protected]com with your: Name, Email, Phone number, Departure town | Prices: €15 return – waged, €10 return – underemployed/student. Rebels4choice have kindly offered to swing by Cashel and pick up any Tipp repealers in need of transport to Dublin for the March for Choice. We are delighted there are now two options for people travelling from Tipp. We are organising transport to the ARC March for Choice on September 30th. We will either get a bus or car pool depending on numbers. Message for more deets, we’ll try to keep costs low.